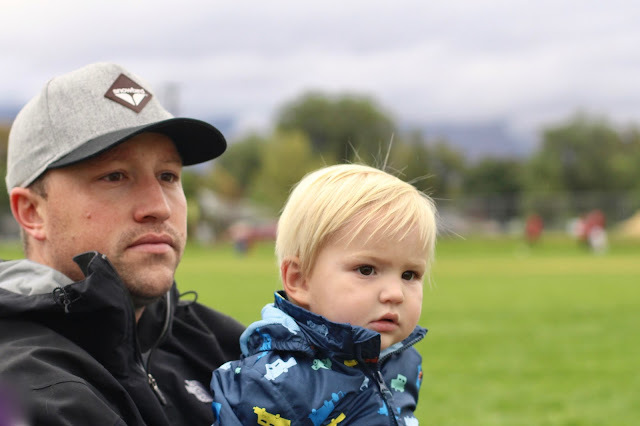 Soccer season has ended until Spring, and both Liam & I are pretty sad about it. This was one of my favorite new stages in this whole parenting thing. I can remember seeing Liam in his shin guards & cleats for his first practice, and I couldn't handle the cuteness. And how old he seemed. Somehow time seems to be going by faster than ever! 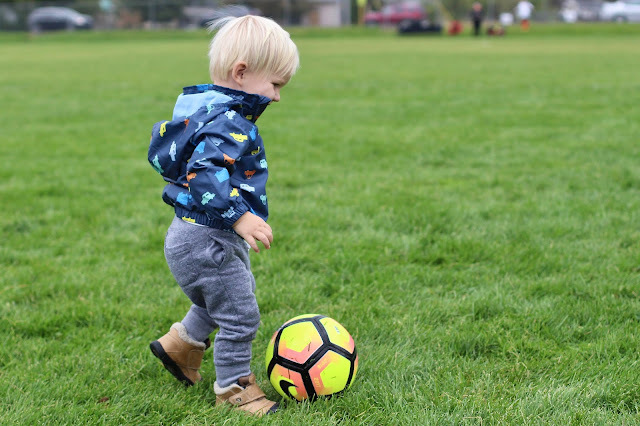 I kinda can't believe that here we are, with our first baby boy already playing soccer! He could not have been placed on a more perfect team. His coach is absolutely wonderful; he's so so patient & always comes up with fun new games to teach certain skills. And more importantly, Liam seems to love all the boys on his team. They are group of adorable blondies who like to do spontaneous "kid cheers" throughout the games. One boy in particular has absolutely no regard for personal space, just like Liam, so the hugs & wrestling is endless between the two. 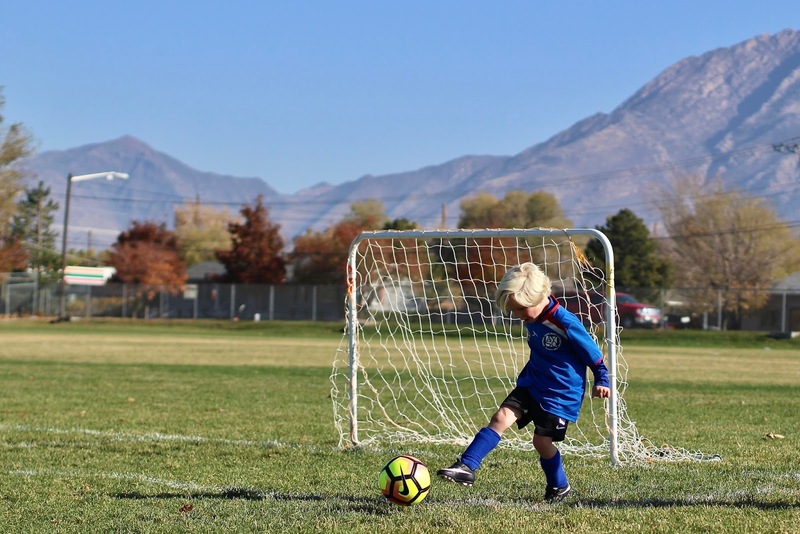 By the end of the season, Liam had nailed his corner kicks & throw ins! He typically got a goal or two each game, and always threw his hands up in the air right after - victory! It was incredible to watch how all the boys improved week after week, and by the final game there was actually quite a bit of passing & teamwork happening, which is quite impressive for a group of 4 & 5 year olds! While Conor & I were often beaming with pride, the games were also filled with plenty of laughter & a bit of anxiety. Liam spends plenty of time on the ground... He quickly learned the art of the "flop"; we're working on that. 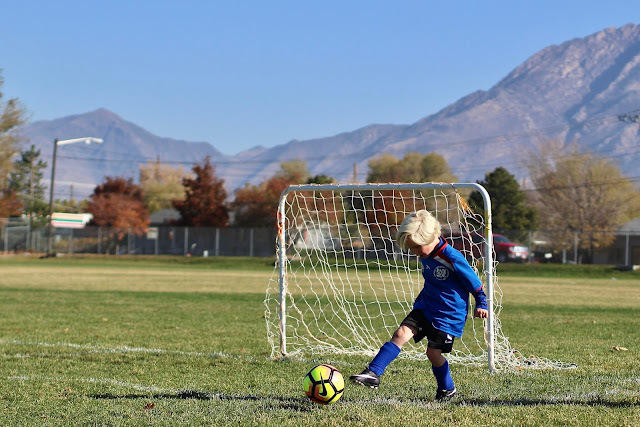 Other times, a kid would be all alone, right in front of the goal, and still manage to miss the shot. Oh the tension, the anxiety! It's thrilling. Seriously, 4 year old soccer is thrilling! I hope to always enjoy Liam's games this much. And he seemed to love them too! There was only one game where we played a much bigger, much older (orange) team, and Liam was getting super frustrated with them taking the ball from him when he was near the goal. I even heard him shout out "Stop it! Stop it Orange!" He's even adorable in his most frustrated moment! But of course, Liam wouldn't be as great as he is without his sideline crew! 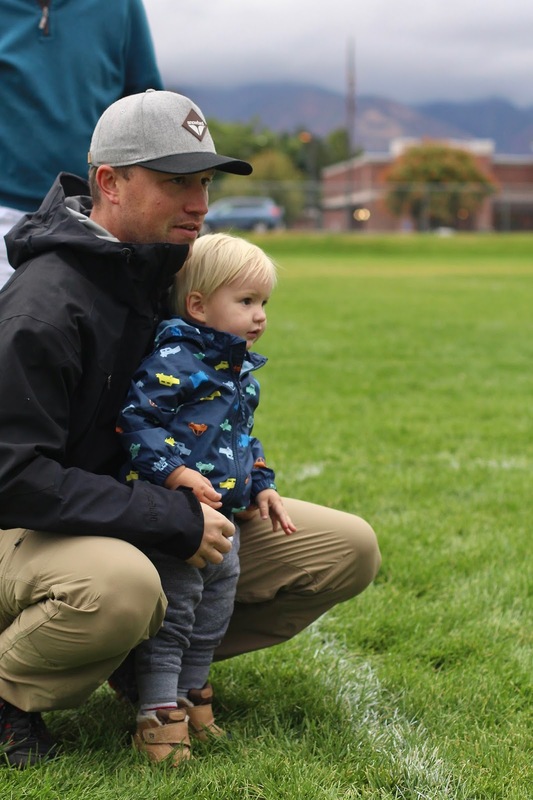 Finn wanted on the field most of the time, but settled into our laps nicely as the season wore on. My parents were able to catch a game, as well as Liam's godfather when he was in town. Except for one slightly cold & rainy morning, we had incredible sunny weather on those Saturday mornings. Could not have asked for a better season or a better start to a hopefully thriving soccer career for Liam! I'm already missing our soccer Saturdays! Although I know as soon as the snow starts hitting the ground (hopefully this Thursday! ), that we will quickly transition to ski season. But for now, the soccer ball & net is packed away until the ground thaws in the Spring! How fun! Soccer is definitely a sport I'm looking forward to, and can support. He's so cute with his little buddies! So much fun!!!!! 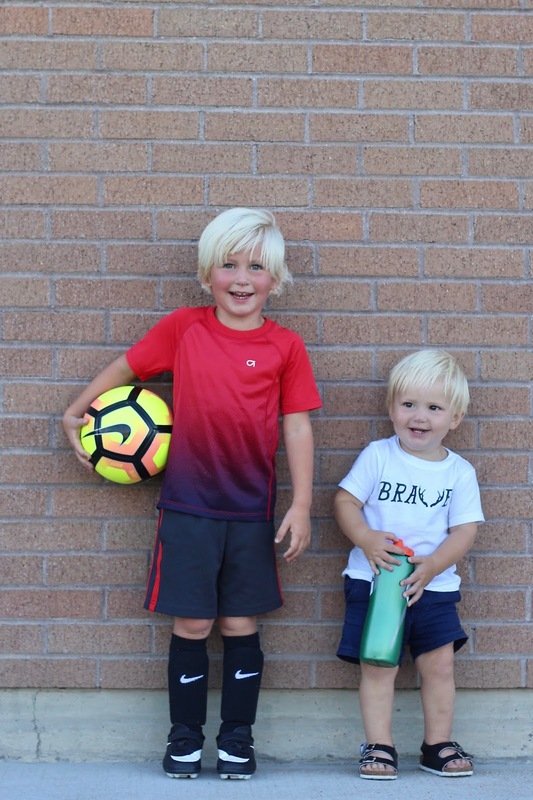 He is the cutest soccer player and little brother is precious cheering him on! Soccer was such a fun experience this year! And it looks and sounds like Liam had an absolute blast! 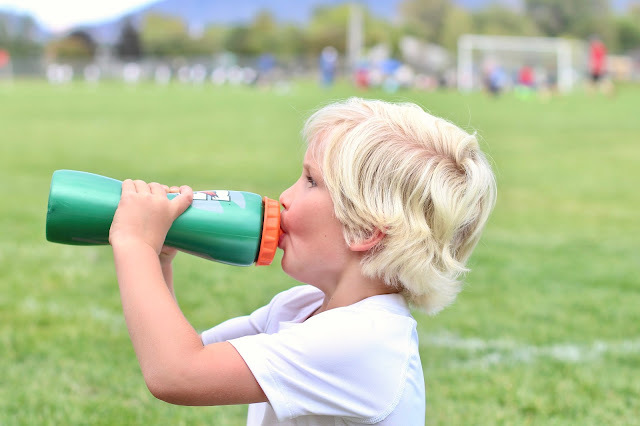 Your AYSO sounds so much more organized than ours. I feel like our coaches just kind of herded cats each week. While it was hilarious, it could have perhaps used a bit more structure. that is so cute. looks like he had a wonderful time.. The best pictures...always! I can't believe how mature he looks out there kicking the ball around like he's a little pro. Glad he's having so much fun with it. Abigail has absolutely zero personal space either. So they'd get along just fine! lol! 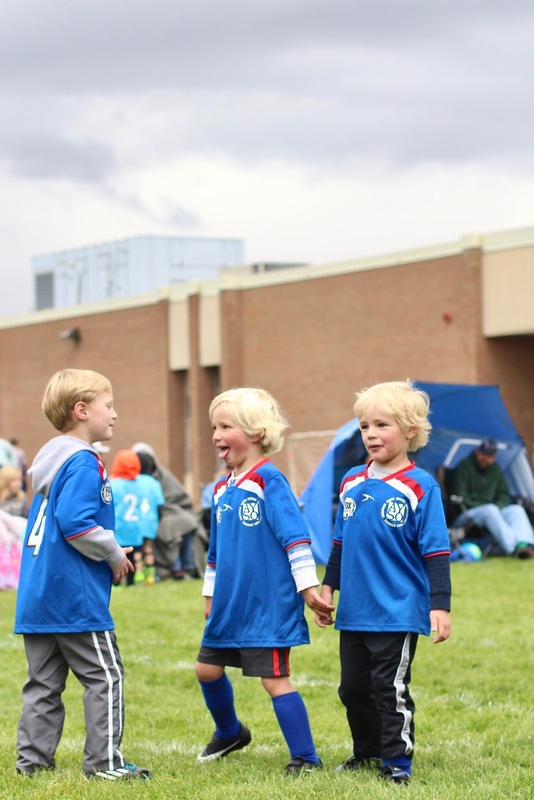 Awe, a team full of blondies :) Watching little kids play sports is one if the most entertaining sights! Gotta love it. Im looking forward to all your snowy photos that are going to happen! Liam is such a natural athlete! I tell you, Noah's soccer experience was nothing like this. If someone came up to get the ball he would give it away to avoid "confrontation"! And I love that he's playing with a bunch of blondies! He is so cute in his uniform! So glad he had a good season! How fun. 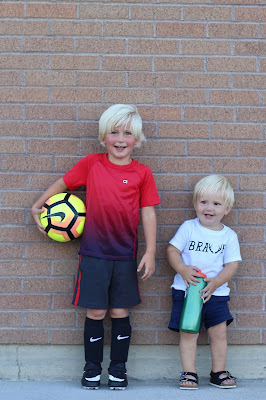 I agree that both of your boys sound like they are natural athletes. My son "hated" soccer. At his last practice, he sat on his ball and refused to get up. Even my husband and I couldn't encourage him to get up and play with us. So glad Liam's Saturday afternoon practices were a hit for the entire family. oh my gosh! this is totally adorable. i hope i have a kid who loves soccer as much as Liam. Liam is the cutest little soccer player ever! I adore the fact that he would throw his hands in the air after scoring a goal. That’s just too precious. 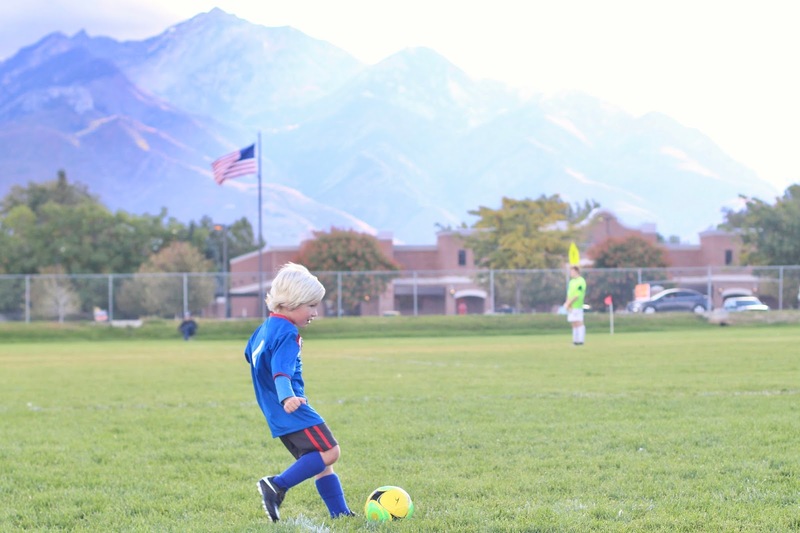 And oh my word…y’all have the prettiest backdrop behind the soccer fields! Gorgeous. 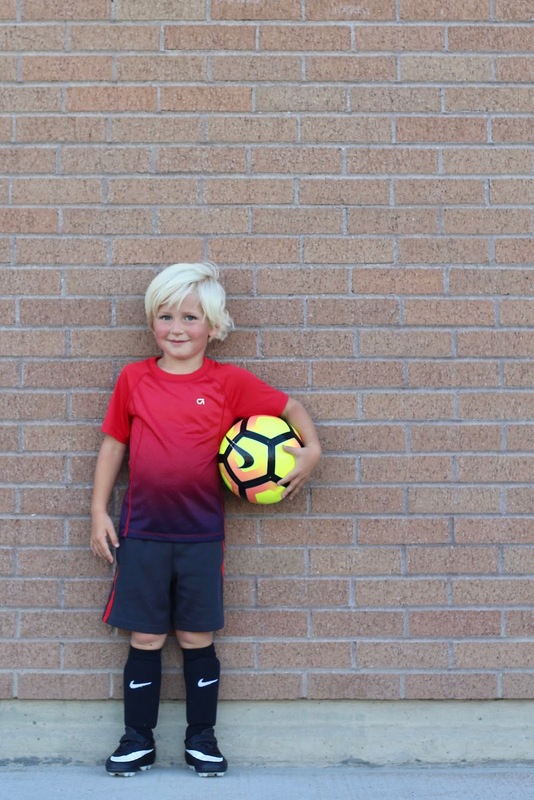 And little Finn will be your next soccer star! I loved your soccer/action shots this season!! Liam looks way too grown up out there. Sounds like he's a natural! !